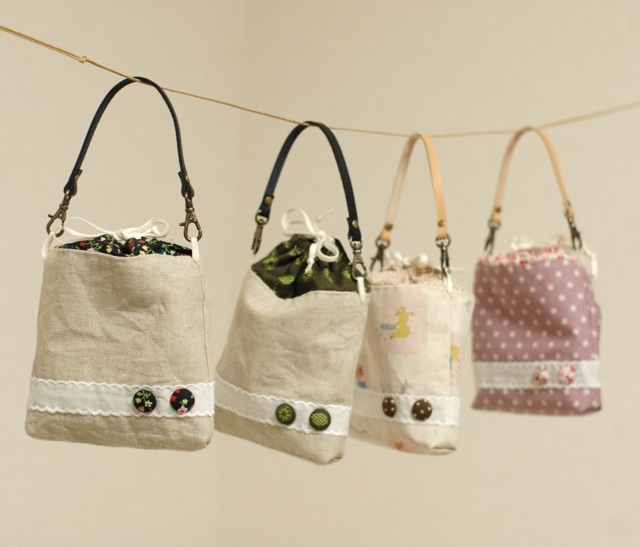 mairuru: New pouches with leather straps and cats. New pouches with leather straps and cats. I got some leather straps recently. They are only 9 inches long, so it fits only small wallet or pouch. So yesterday I made these pouches. At first I wondered how I close the pouch. With a zipper or a flap? Then I thought of drawstring. I wanted to make a little fat shape one. I used thick cotton linen fabric to make the bottom sharp. Then made two fabric covered buttons to decorate it. It's fun to think a new design, isn't it? When I finished making it, I really liked the shape (* v *)!!!!! 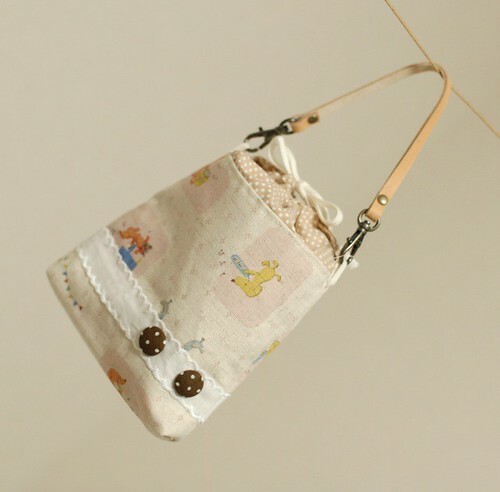 It can hold only change wallets, cell phones or some candies. I think it's good for kids also. This was very easy to make. 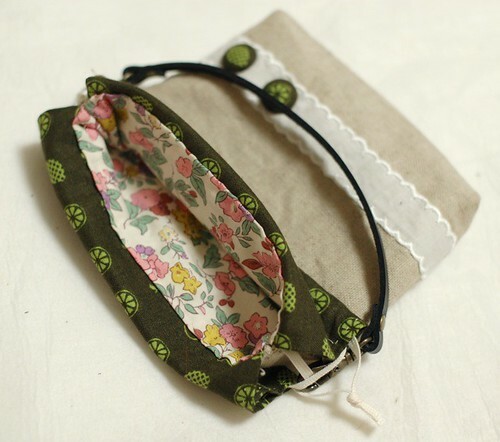 I'd like to write here the instruction to make this type of pouch. 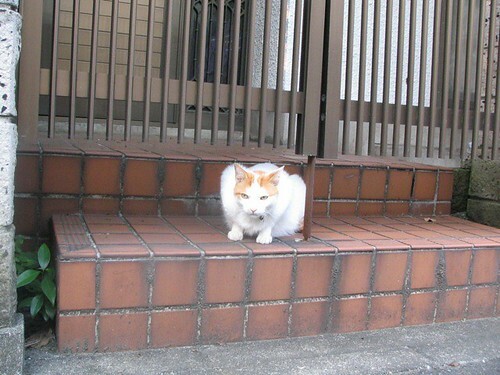 When I went out yesterday, I saw some cute cats. I like his/her cute face very much!!!! He/she run away soon after I took this picture. 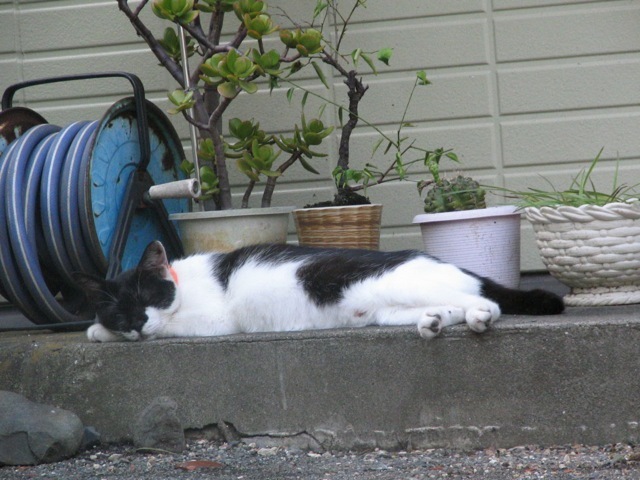 I also went to see Bo-chan and he was sleeping well too. Gosh those new pouches are soooo beautiful. Sorry I just re-read your comments. You did say what can be put in the new pouches ;) Thanks. thank you again Mai for another beautiful post - your creativity never ceases to amaze me. Where did you find those beautiful leather straps? Look forward to your tutorial, as always. Oh boy are those bags ever cute. And I love your round up of kitties! This bags are so nice! 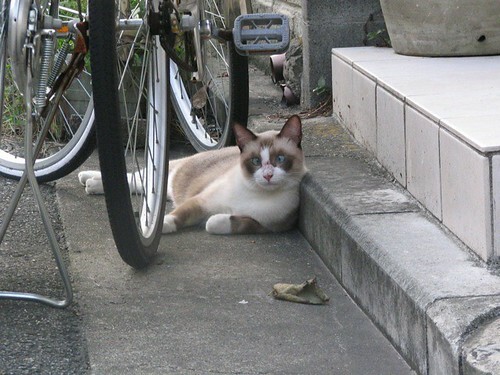 And I like the cat with blue eyes :)) Thanks a lot! Yes, please write up the directions for these pouches! They are darling! 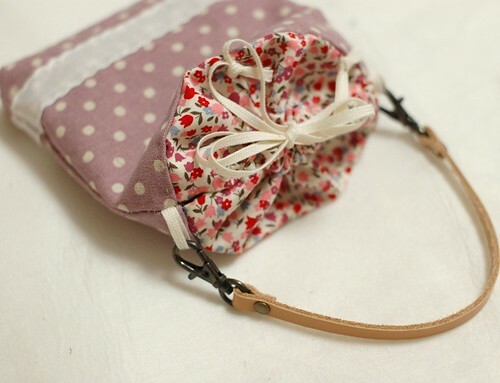 Mai, these pouches are gorgeous and so cute! 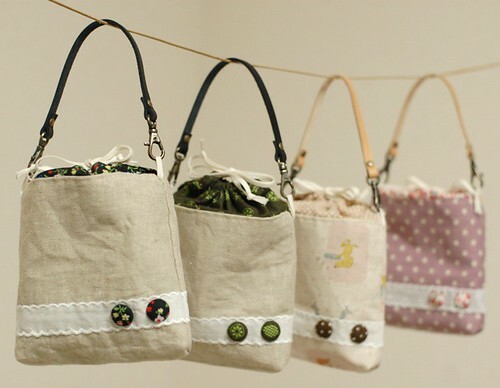 Would love for you to write a tutorial on these cute little pouches! Thank you in advance. :) Have a lovely merry happy day and love to you! Another great project you have made. The bags are just so darling. Those are lovely. The shape is quite fantastic. 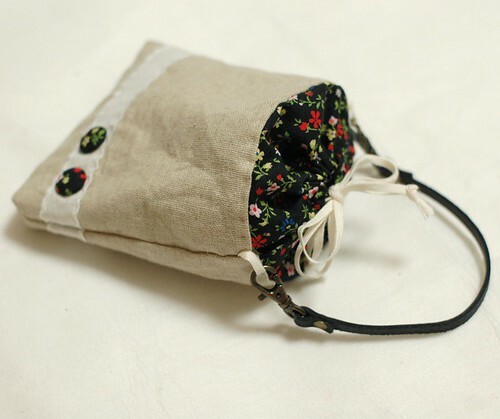 The pouches are really cute and original, definitely a great idea! 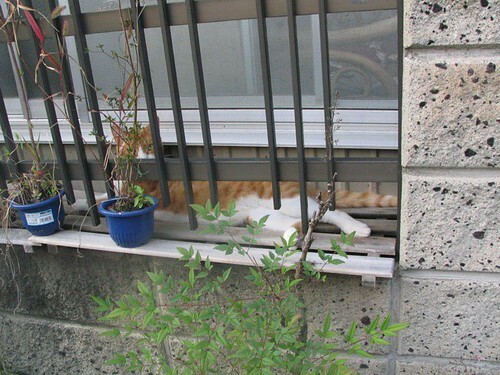 I loved the cats, I have three and they make me very happy! hey mai, i agree with the rest... they are REALLY CUTE! Thank you very much for your all comments! I got these straps from one of Japanese online shops. It's not so expensive and beautiful. Your bags, like all your other items, are gorgeous! Your little bags came out so nicely! All of the little details are so special. The first cat with the cute face looks like his eyes are crossed. Our little girl had crossed eyes when she was a baby, and she was cute too! Hi, I love cats too! I discovere your blog and I'm under de charm of your creations! Thank you for bringing more information to this topic for me. I'm truly grateful and really impressed. I love to read this blog very interesting. Leather craft and stamp tags --> My new pouches! Try and Error, I made four leather straps!!! !